This spring, I went on a short vacation to New York City. Springtime in Manhattan is a colorful contrast to its darker and more dreary winters; cherry blossom trees are in bloom and New Yorkers shed their winter coats for lighter and brighter jackets. As my friends and I filled ourselves with pizza and bagels, I realized that one of the best parts of my time was that I didn’t have to worry about how much I was spending. Earlier this year, I decided to be smarter with my vacation spending. Instead of going on a vacation and counting the cost afterwards, I resolved to set a budget and save up for my vacation in advance. I created an “NYC” Envelope in Goodbudget and filled it with a portion of my paycheck each month. After several months of saving, my NYC Envelope was full and Goodbudget was ready to fly with me to New York! I had never tracked my vacation spending before, but I knew I wanted to keep track of how much I spent in each budgeting category. So, I recorded my expenses in their usual Envelopes, but tagged each transaction #NYC. This let me track my expenses via my Envelopes, but also keep a running tally of how much I had spent overall during my trip. 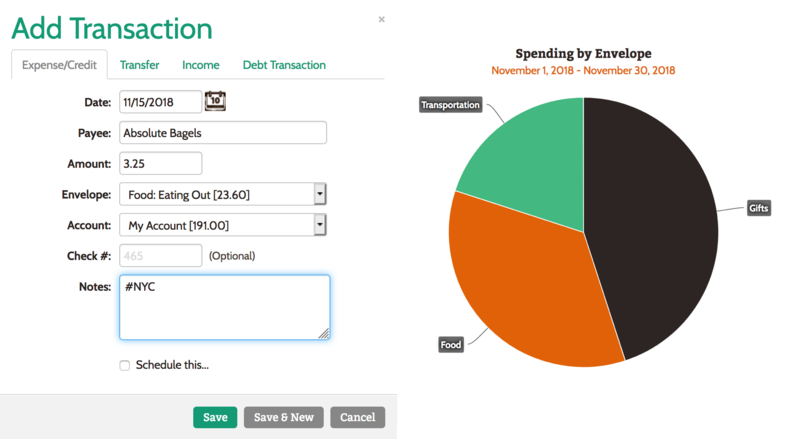 Every now and then, I would check the Spending by Envelope Report and filter by the #NYC tag to see how I was doing overall and make sure that I only spend the amount that I had saved. The report showed me where my money was going and helped me to reflect on my experience. Because I had already set aside enough to pay for my vacation, I didn’t have to worry about how much things cost while I was there. This allowed me to simply enjoy my time and make the most of it. As a side benefit, seeing my reports in Goodbudget also taught me more about what I actually enjoyed. Though I expected to spend money on museums or tours, I was actually more excited about eating out with my friends and walking around the city. This information will be helpful for planning my next vacation! This is great! How do I add that filter? Hi Sacred Walker – Once you tag your transactions, you’ll be able to filter for them in your Spending by Envelope report. You can see how to tag transactions here. Thanks! The filtering by tag isn’t available on the app screen for me. I’ve got the free version. Hi Claire – Filtering by tag is available on the web only.